With all of the products in the world that are sold from the largest retailers to the smallest online shops, it’s amazing just how often you can’t find exactly what you want. Maybe the size, shape or colors aren’t right. Perhaps it’s the functionality. Or even the price. We’ve all said, “I wish I could just find this,” whatever “this” is. While there’s no hard scientific data, it’s pretty clear this phenomenon happens to makers—a lot. 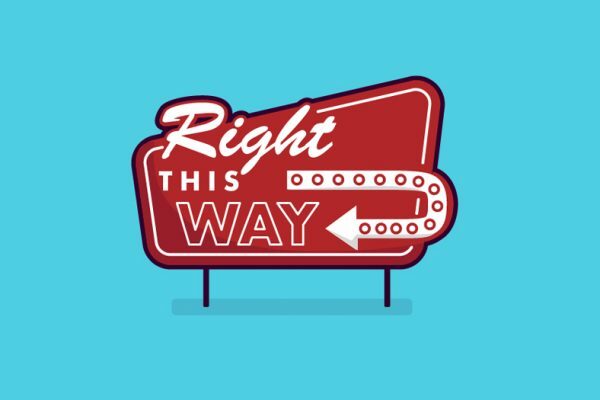 In fact, many makers get started making because the “right” products simply don’t exist. This is true for Liz Bradshaw, who spends her days as a science communicator for a large research collaborative studying noroviruses (the stomach flu). In her spare time, she shares her love of science through art at Wishcraft Studio. And one of her passions is building wooden dollhouses. “There is a lack of new or different designs out there for dollhouses, and only a couple of kit-making companies still exist in the U.S.,” she says. Unable to find what her heart desired, she stopped wishing for the perfect dollhouse and started making them. Making miniatures is no small task. Getting the scale right is essential. That’s the science. And the attention to detail is what makes the dollhouse experience authentic. That’s the art. 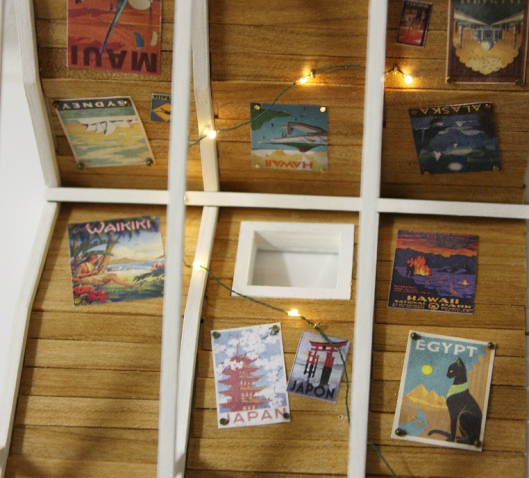 Liz’s Hawaiian bungalow is the perfect blend of science and art. And it’s so cool that you’ll wish there was a life-size version of it that you could visit. 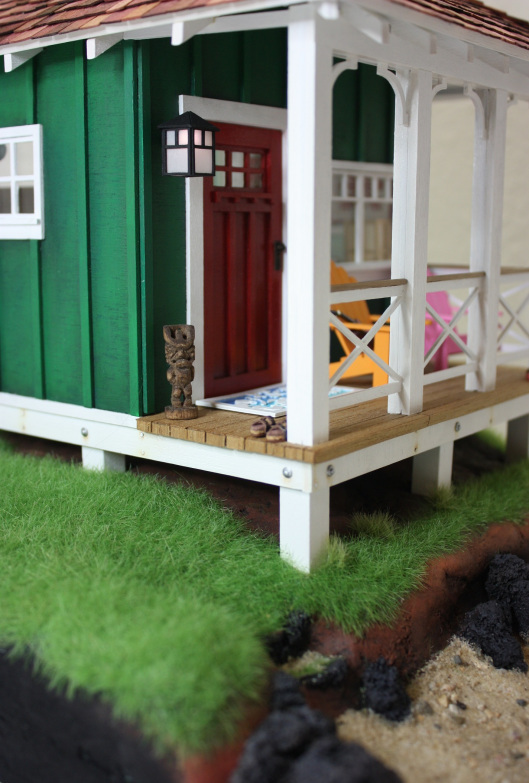 Liz began designing the Ohana House on paper at half scale (1:24, or half an inch equals a foot). 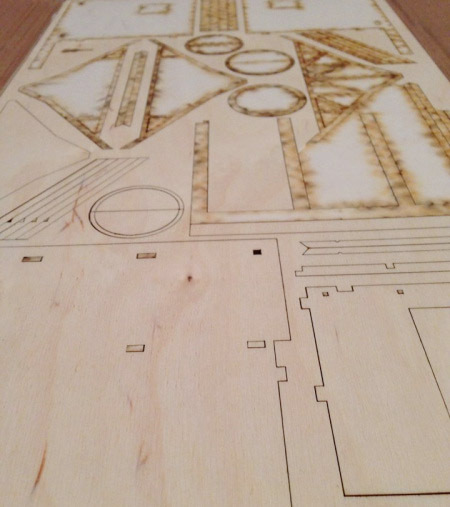 Once the details were perfect, she then recreated the building as well as some of the furniture pieces in Adobe Illustrator to prep them for laser cutting. And this person would also love music, which can be seen in the stellar record collection and the ukulele that’s just waiting to be picked up and played. 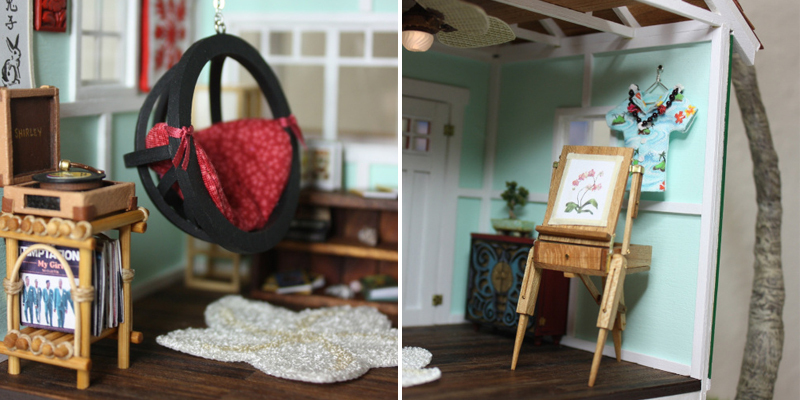 In addition to laser cutting, Liz hand-crafted all of the other pieces in the dollhouse. You’ll definitely want to read her post on the project, where she explains how she recreated Maui’s soil and fashioned a palm tree for the exterior, hand carved a tiki, made Adirondack chairs from wooden coffee stirrers picked up from her travels to the Bahamas and Portland, Oregon, and created an amazing collection of vinyl albums because “a family beach house wouldn’t be right without my father’s tunes wafting through the windows.” Plus, you’ll also get to see the world’s tiniest pair of Birkenstocks, made of real cork, leather and human angst. Don’t miss it! 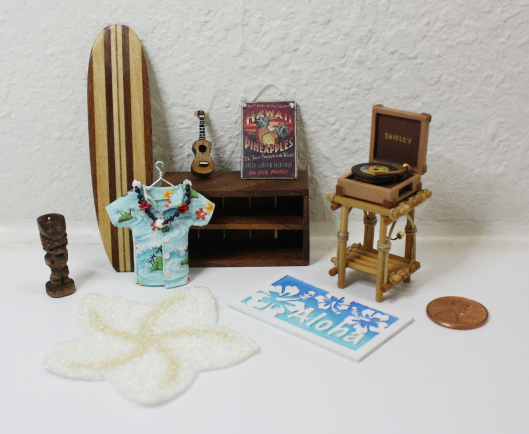 Liz says that she knew she wanted to try laser cutting for the Ohana House, so she first contacted people in other miniature hobbies such as model railroads, remote controlled airplanes, etc., to get recommendations. 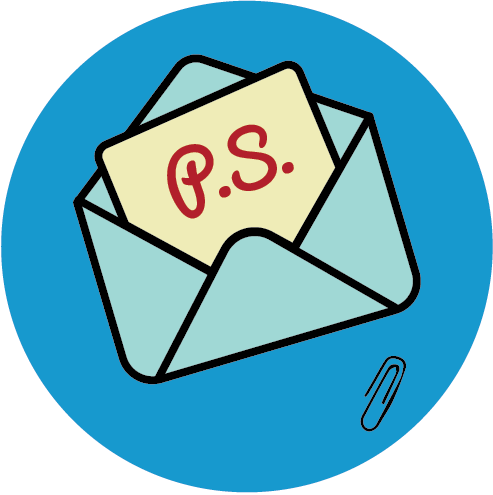 “I found a couple of individuals who I could send the files to and pay, but I was less convinced of the quality of the work,” she says. “A simple Google search turned up Ponoko, and I liked that I could play around with designs to see what they will cost ahead of time. I was also impressed by how hard Ponoko works to protect the wood from laser burns or the tiny parts from getting lost. Another benefit of having the plans digitally created is that Liz can easily make copies of the dollhouse if someone asks. 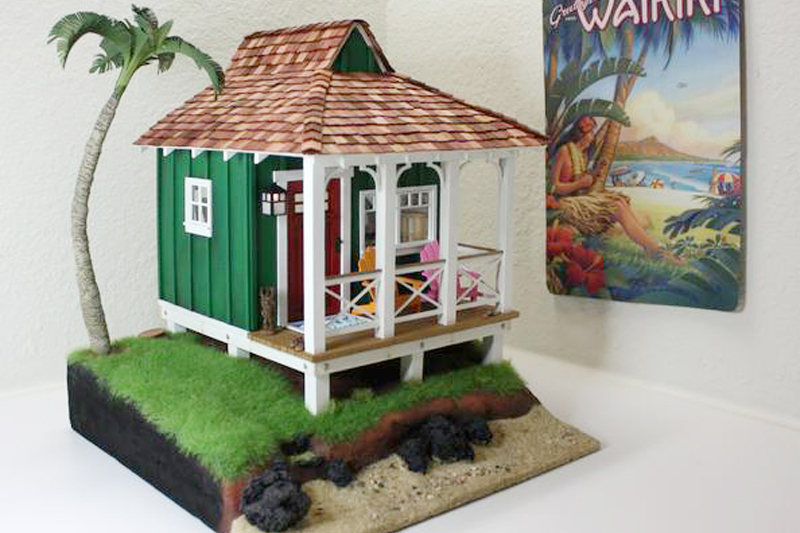 “After I finished the Ohana House, members of the miniatures club I am in wanted to make their own, so I ended up cutting 15 more dollhouse kits and designing beach-themed furniture to go with them,” she says. But Liz’s miniatures club pals aren’t the only ones taking notice of her skill and creativity. 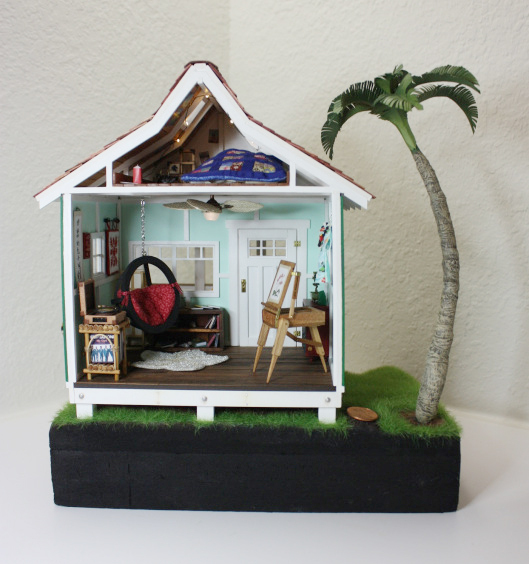 In fact, the Ohana House was the runner-up in an Undersized Urbanite contest for excellence in making dollhouses! 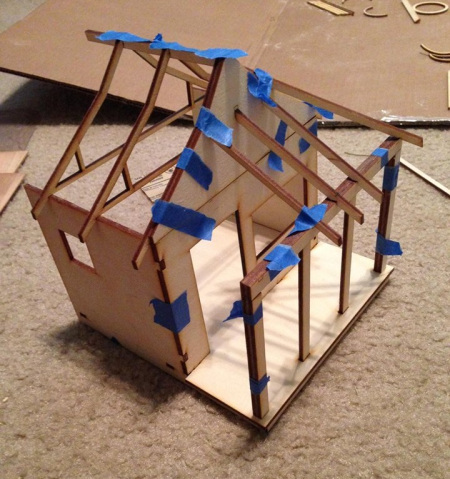 Building wooden dollhouses is truly a labor of love. 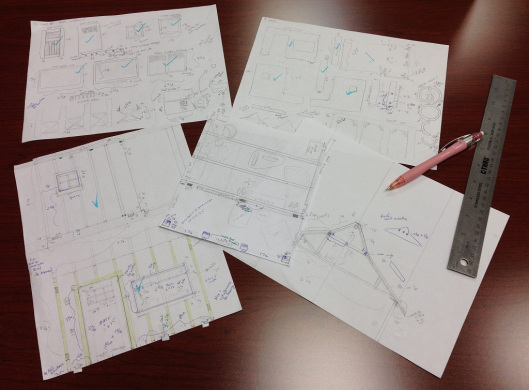 And you can see the care Liz puts into her designs with every little detail she includes. So while every project is a new learning experience, the Ohana House taught Liz more than how to create the perfect beach house. To learn more about Liz, don’t miss this this interview with Undersized Urbanite. 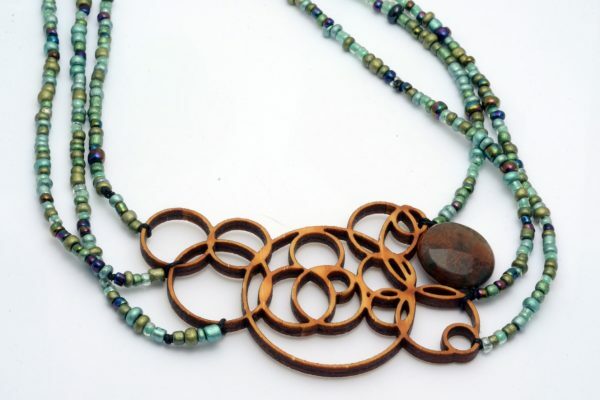 And to keep up with what she is making, visit her website. Liz has absolutely amazing skills. I completely lose track of time when reading her blog. 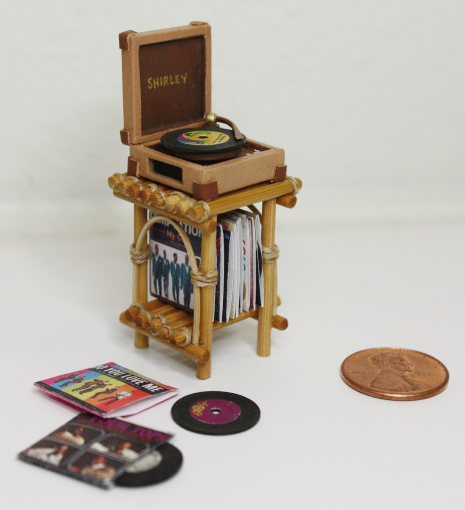 Do you know how many times I tried to make a record player for my Barbie? For the arm I took a common pin and bent it at the end. Hi Dianne, they certainly are pretty neat! Sounds like you were a maker from an early age, great stuff.